You will notice ET markings stamped into the surface of alloy wheels, the ET abbreviation stands for Einpresstiefe word in German which roughly translates into “depth of imprint“. You can also find this value labeled as Rim Offset and it’s one of the key definitions of any vehicle wheel rim. Using the correct wheel widths and an appropriate tyre size is incredibly important. The size of your tyre is dictated by the width of the wheel. So, always take into consideration the tyre width where the contact is made with the wheel when you are choosing wheel sizes. Getting this wrong can cause severe damage to your wheels, your car and you risk your tyre exploding, which can cause a terrible accident. What exactly is wheel ET? Wheel offset or ET is the distance between the hub mounting face and the line that cuts through the centre of your wheel. You can usually find the offset engraved or stamped into the wheel. 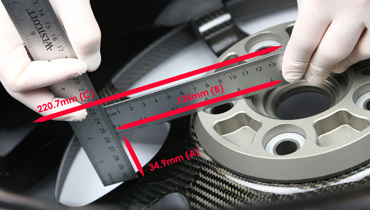 It measures the amount of ET millimetres the wheel will stick out of the mounting surface. ET is an abbreviating of the German word “Einpresstiefe”, which translates as “insertion depth”. Depending on how the tyre sits, you can have positive, negative or zero offset. Positive offset: This means the mounting surface is towards the front or face of the wheel. It is common to find positive ET wheels in front wheel drive cars. Negative offset: The mounting face is at the back of the wheel, quite the opposite to positive offset. You will find this type of wheel ET in rear-wheel drive cars, especially powerful ones. 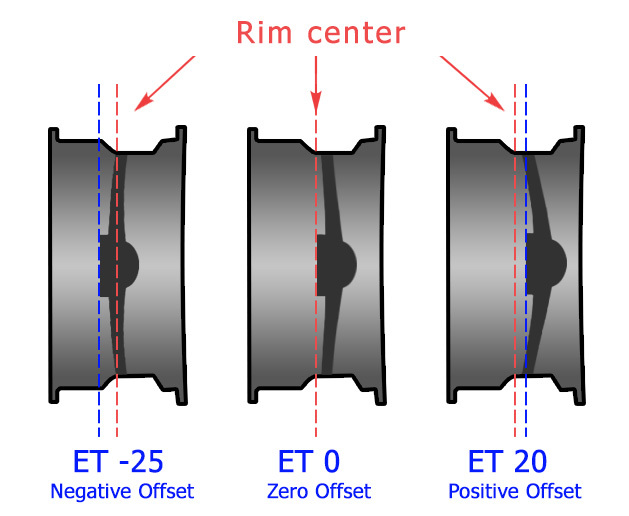 Zero offset: Known, by definition, as “ET 0”, this type of wheel ET means the mounting surface is in line with the centre of the wheel. You should be able to find the ET value of your wheel stamped on the wheel itself. The ET indicates the millimetres that can be measured between the mounting surface and the symmetry axle of the wheel, considered the geometric centre. The lower the ET value, the further out your alloy wheels will stick out. In contrast, the higher the ET value, the deeper under the wheel arch your wheels will be. One thing to bear in mind is that the offset is not an exclusive factor to decide the location of the wheel. For example, even if the ET value is 30 (ET30) for both a 9-inch and a 6-inch wheel, the larger wheel will stick out further. Why is wheel offset important? When you think of a car’s chassis, you need to see it as more than a sum of parts. It has been made and designed to work in complete unison, a well-oiled machine where one minor adjustment can have a huge impact on other parts. Such a simple thing as changing the tyres of your car can affect the way it handles, so logically, changing the wheel ET of your car, can have major impacts. But, more importantly, getting it wrong can cause major disasters. If you get the offset wrong installing new wheels, you run the risk of having the wheel sit too deep inside the wheel arch. What can this cause? It can cause the inner edge of the wheel to rub with the suspension. This will damage the inner side of the wheel and to the suspension. What’s worse is tyre rub, as this rips the inside sidewall very rapidly. Detecting damage in this area is very difficult, until it is too late. This is the risk you run if you change a positive offset, meaning, pushing the wheel deeper into the arch. If you change a negative offset, there normally aren’t any inconveniences. It will substantially change the look of your car. However, you still need to consider the wheel size when changing the negative offset, because if you choose wheels that are too big, the tyre will rub against the arch. This will cause the same damage as it rubbing against the suspension, but it is a lot easier to detect. Can I calculate the ET myself? If you can’t read the ET of your wheels or it isn’t printed, it is possible to measure it yourself. Because the ET is the measurement between the mounting and the centre line of the wheel, you won’t be able to measure that with the tyre on. But there is a simple wat to find the wheel ET using measurements from the sidewall of the tyre. Start by laying the tyre/wheel on the floor, face down so you can measure inside the wheel and use a straight edge placed across the tyre. Once you have done that, measure the distance from the floor to the straight edge. Make note of the number and divide it by 2. This gives you the centre line of the wheel. Now, measure from the straight edge to the inside of your alloy wheels. Make a note of that number too and subtract the number you measured for your centre line and the one you just measured. Smallest number from the largest. When the centre line measurement is the smallest, it means you have a positive offset. In the vast majority of cases, a change of just 5mm to your offset it enough to affect the handling of your vehicle. There are spacers and options available to help you install your desired tyres, but you should always consider how much you are changing your wheel ET. – Have a test fit to double check nothing rubs. – Check brake caliper clearance. Make sure your breaks fit in your new wheels. – Extra width in your tyres needs to be counteracted with the right backspacing. – ALWAYS double check the wheel ET of the wheels you are wanting to install. – Ensure the lug nuts are tightened with an adequately calibrated torque wrench. – If you have any doubts, always ask a qualified mechanic or take your car to your local garage. Having your wheels at the correct offset will help you save money in the long run, as your tyres will last longer and not suffer from unexpected damage. It will also prevent accidents from happening due to a blowout or handling troubles. So, be safe and have your wheels correctly offset. Wheel fitment guide for all car models by brand and year. Find rim sizes PCD bolt patterns and other details. Still have questions? Feel free to comment below.